Another Innovative Product from FTM! Designing and creating acrylic displays with adjustable shelves has always come with its challenges. For many years fabricators often glued on acrylic cubes, square rod, or strips of sheet material to create grooves or supports for shelves. Although these designs were clever and showed some ingenuity, they were often unsightly. FTM’s Adjustable Fixture Hardware is the solution. It offers a clean, polished, and professional look. 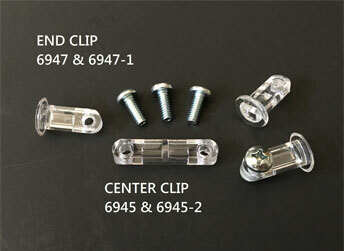 These clips are made from Clear Polycarbonate with a 1/4 - 20 threaded hole. Adjustable Fixture Hardware makes your display shelves fast and easy to adjust with an eye- catching appearance. No gluing is required! How to use: Drill or laser cut 1/2” holes in the display sides any place a clip is desired. These holes can be as close as 1” center to center, or few and far between. A shelf will require one clip in each corner. Drill or laser cut 5/16” holes in the shelves so when installed, the holes will line up with the threaded holes in the clips (measure twice, cut once). To assemble, pass the End Clips through the 1/2” holes in the display so the threaded end of the clip is on the inside of the display and the flat side faces up. Secure the shelf with screws (do not over tighten). With all holes properly placed, shelves will be secure and add strength to your display. Note: Phillips Pan Head Screw is supplied at a length of 5/8"